It was a sunny warm summer Sunday, and a holiday weekend. Most people would spend their time outside, hiking, biking, on the beach, at a family picnic. I spent 12 hours inside a mostly darkened theater, having one of the most captivating theatrical experiences of my life. Yes, it was my All Our Tragic binge day at The Hypocrites. Some people binge on Orange Is the New Black. I’ve binged on three plays a day at theater festivals and at the six-hour production of Gatz, a reading of The Great Gatsby. This time I binged on 12 hours of Greek tragedy, including uncounted beheadings, stabbings, poisonings, horse stompings and ritual sacrifice. It was exhilarating. If you consume or read about theater, you know that All Our Tragic is the latest production created by the very creative and passionate Sean Graney, founder and former artistic director of The Hypocrites. All Our Tragic is actually a four-act play adapted from all 32 surviving Greek tragedies by Aeschylus, Euripides and Sophocles. Graney has mashed them up into four parts titled Physics, Politics, Patriotics and Poetics. There are some excellent performances among the cast of 23 (14 actors, 3 Odd Jobs, and six Neo-Titans or fighters). Walter Briggs goes from wide-eyed innocent Herakles to general and king Agamemnon. The talented and versatile Zeke Sulkes plays Aegeus, the king with goat feet, as well as Kreon and others. Luce Metrius is really fine as Jason and Achilles. Christine Stulik, Erin Barlow and Dana Omar stand out among the seven sisters (think of the Pleiades) armed with lethal umbrellas. It’s really only nine hours of theater, broken up with intermissions and food breaks. The show is the first production at The Hypocrites’ new space on Milwaukee Avenue at street level below the Den Theatre. You don’t need to leave the theater because snacks are served at all breaks with lunch and dinner meal breaks. Coffee, water and a cash bar are available. The food is vegan, Middle Eastern and delicious. Dinner break is an hour and there are many restaurants nearby, in case you want to leave the theater. The Greek marathon goes on from 11am to 11pm Saturdays and Sundays through October 5. You can also see each play separately on Friday nights and some Mondays. But the immersive experience is mesmerizing and worth giving up a day of your life. There wasn’t a moment when I wasn’t fully engaged. I was never bored or checking the time on my smartphone. The full house audience Sunday also came to stay and be fascinated by the Hypocrites’ tragic bash. This post is sort of a wandering commentary about what it’s like to spend a long tragic Sunday with The Hypocrites. I haven’t tried to write this as a review because there have been plenty of those already, including this amazing one by two of my Gapers Block colleagues, who did team coverage of All Our Tragic. My rating for All Our Tragic: 4 stars. 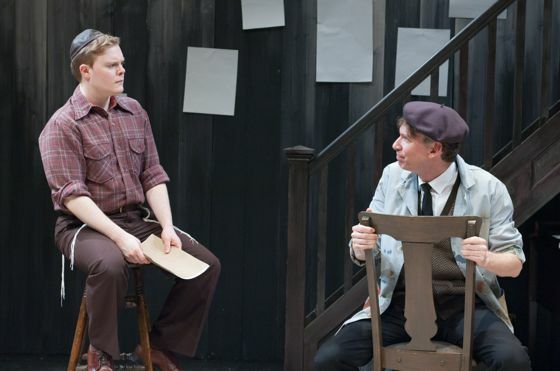 This weekend I also saw and reviewed the excellent new Timeline play, My Name Is Asher Lev, at Stage 773 on Belmont. This is the story about the young Hasidic man in Brooklyn who is torn between his family and religion and his passion to be a painter. The play is written by Aaron Posner and adapted from the best-selling 1972 novel about the Brooklyn Hasidic community by author and rabbi Chaim Potok. Director Kimberly Senior has done a terrific job of working with the three actors, two of whom play many parts, and creating a strong and compelling whole. Here’s my review in Gapers Block. My rating for My Name Is Asher Lev: 4 stars. See the Theatre in Chicago website for compilations of current plays. It’s a great resource. Very interesting. I never knew about this. Thanks!